Egypt launched on Wednesday the first air strike on militants in the Sinai region since 1973, killing at least 20 terrorists in an operation described by the Egyptian media as the "Sinai cleansing operation." According to Egyptian security sources, over 2,000 Islamic militants reside in the Sinai region. Egyptian media outlets reported that Egypt launched air strikes in the Sinai region close to the border with Israel early Wednesday morning, in an unprecedented operation which intends to secure the region once again. Security sources have begun briefing the Egyptian media on the details of the Sinai operation. Al-Youm al-Sabaa quoted a security source as saying that Egyptian authorities received Israel's consent prior to launching the air strikes in Sinai. The source further said that Israel consented to Egypt's use of advanced military equipment in the attack on area C, a region close to the border with Israel. According to the security source, the operation was coordinated between the two countries and based on the agreed upon order of battle under the Israel-Egypt peace treaty. Egyptian daily al-Youm al-Sabaa reported that the offensive in northern Sinai ended after five hours of clashes with armed militants and Egyptian air strikes. An Egyptian military official said that Egyptian troops were still pursuing militants in several areas. According to a report in Al Masrawy newspaper, the decision to attack in Sinai was made on Monday during a meeting between the Egyptian military command and police forces. It was decided that the Egyptian Air Force would strike three different terror nests, including nests in the city of Rafah and Sheikh Zuwayed. Security sources in the Sinai city of Sheikh Zuwayed reported that the army is currently raiding hundreds of houses in the region hoping to trace terrorists and confiscate weapons. They added that the heavy gunfire had virtually stopped but that there are sporadic blasts and that aircrafts are still circling the skies. Medical sources have said that the bodies of the terrorists that died in the operation have yet to arrive to hospitals in the area. Meanwhile, as a reaction to Sunday's deadly attack on Egypt's border with Israel, that left 16 Egyptian border troops dead, media outlets have reported that Hamas has announced its decision to deploy forces along the border with Egypt and has raised the security alert level. 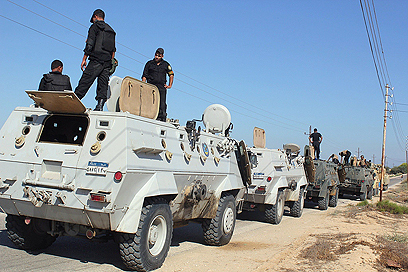 The decision comes as an effort to prevent weapons smuggling from the Gaza Strip into Egypt. In a statement posted on Hamas' website, the Gaza ruling movement condemned “the ugly crime committed against the Egyptian soldiers," and sent its condolences to "the families of the victims, to Egypt’s president and to his government." Since Mubarak stepped down, Israel has allowed Egypt to send in more troops to Sinai, which has been mostly demilitarized according to the 1979 peace deal between the two countries. The attack Sunday touched off renewed calls in Egypt to amend the treaty to allow for more troops in Sinai. See all talkbacks "Egypt hunting down 2,000 terrorists"